After leaving Portland, I went straight to the west coast and stayed on the coastal road until San Francisco (route map here). 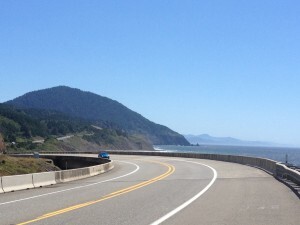 The pacific coast bike route mostly follows highway 101 in Oregon and then changes to highway 1 in California. This route is quite popular among the touring cyclists so much so that several campsites along the way have special hiker/biker facilities – basically subsidised camping facilities for touring cyclists (5USD). These campsites even have hot showers! 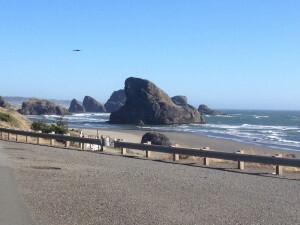 The sandy beaches, cliffs, sand dunes and the lovely views along the coast draws several tourists so traffic was heavy at times, mostly near the big towns. 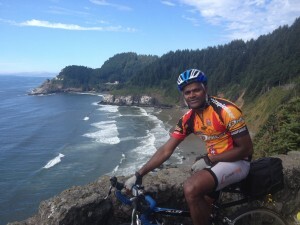 I met several cyclists who were doing different sections of this route. Steve from Portland had cycled this route 9 times, I made use of his knowledge of the cafés and campsites along the route- many thanks Steve. 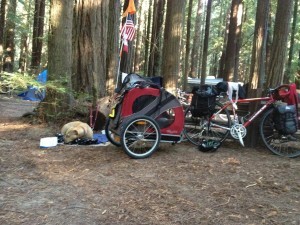 Jake, Mike, Mathieu and Cayla were some other cyclists with whom I was sharing the campsites. 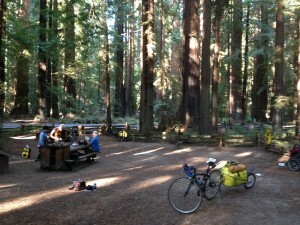 Although we all cycled at different speeds we camped at the same campsites everyday- cyclists party everyday. 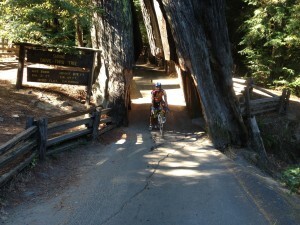 In California, the route goes via some spectacular Redwoods forest. 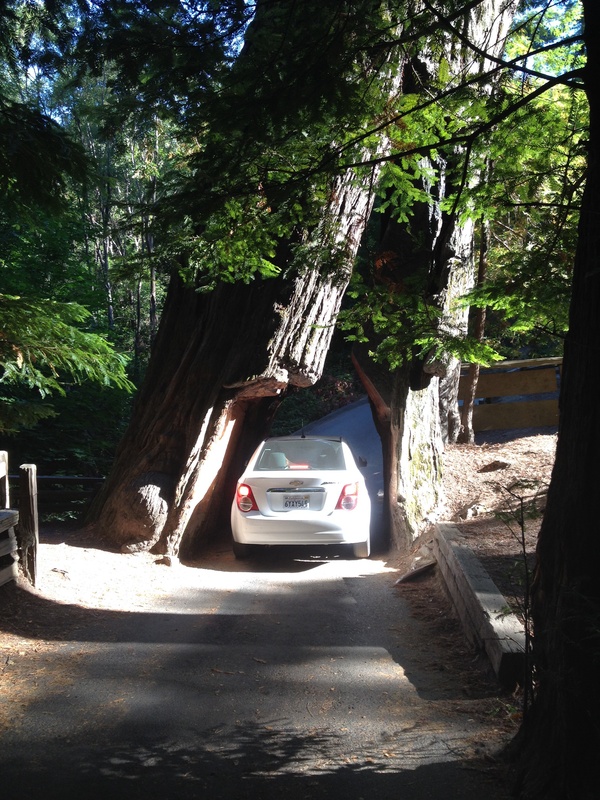 The Avenue of the Giants is a 20 mile stretch of lovely tarmac that goes through these giant Redwood trees in Northern California. Riding on this road felt like being in a fantasy world, it was surreal. 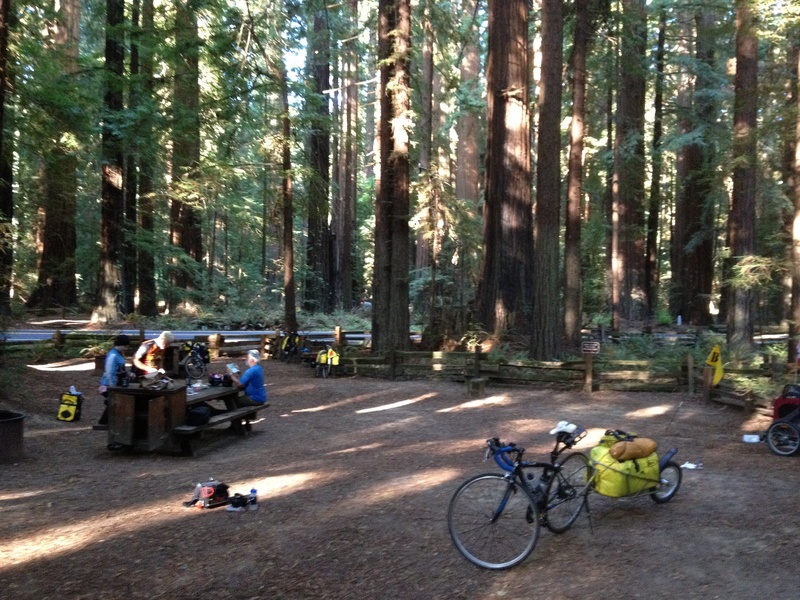 We camped in the Humboldt Redwoods forest, a lovely campsite right in the middle of the Redwood trees. There were some trees big enough to cut a hole for a car to drive through (see the picture), this was insane. Oh well, I couldn’t resist riding through. Of the total of fourteen days for this part of my trip, I had rain only on one occasion. One morning when I woke up I realised my front part of the tent was floating in water. I had to either move or pack up and leave. I decided to pack up and cycle in the rain. After a couple of hours of riding in the rain I stopped at McDonalds to get a coffee since I was not comfortable to walk in to an independent coffee shop with my wet clothes and muddy shoes. I thought McDonald’s won’t reject me! On a related note, in San Francisco I noticed some homeless people walk into Safeway (big supermarket chain) to get some food from the deli, although the security guy kept an eye on these people. At least they had a place to sit down and eat some food at affordable prices. This makes me think twice about bashing big chains. Perhaps the social functions of these big chains is not well understood by the urban elites who hate big chain enterprises. In the private campsite at Manchester I took a day off to enjoy the hot tub and swimming pool. Later that evening I realised that I did not have an extra day that I assumed. So the next day, my alarm went off at 5am and I started pedalling at 6am since I had to cover two days distance in one. I cycled about 180 Km’s along the rugged, undulating coast line of Norther California and after 11 hours I reached the campsite for the day. I just kept spinning slow and steady. The total elevation gain for the day was 2240 metres. 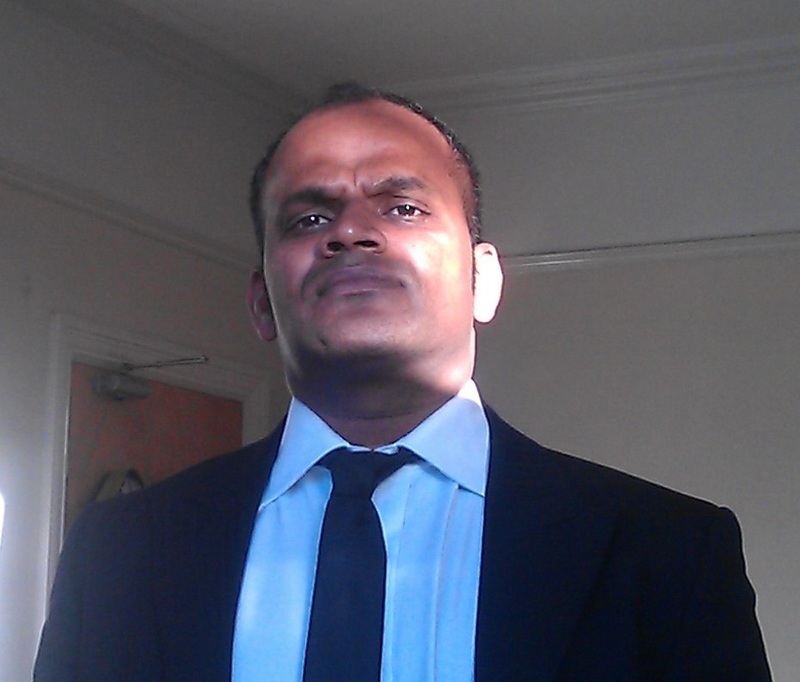 Once again I realised, when the mind sets the challenge the body can handle it. 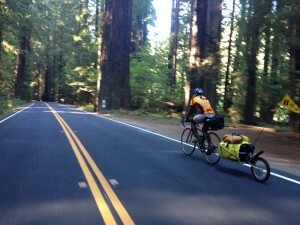 I thought my trailer is heavy but I met some some cyclists who do more challenging rides. 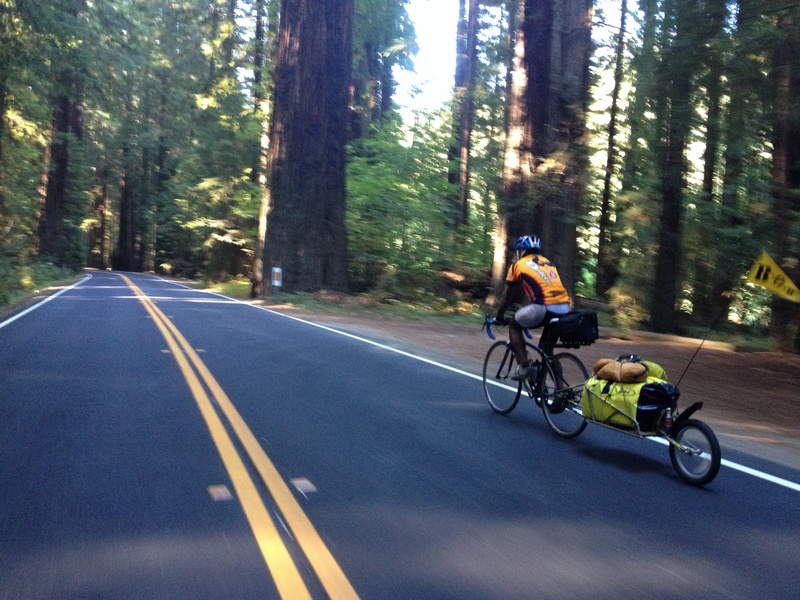 One of them was Cayla who was cycling from Victoria in Vancouver Islands to San Francisco with her dog Ottis who is about 20 kilo grams in a trailer. She had to carry food for him and look after him. 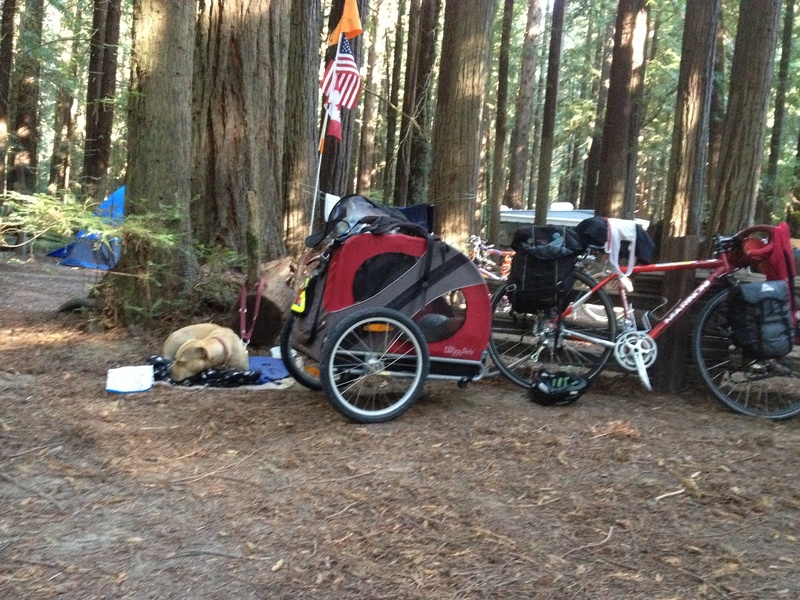 It was great to have a pet at the campsites though. Irene was another lady who was cycling with her 8 year old son. He cannot ride independently on big roads so she was pulling him using a kids trailer. On top of this, she was homeschooling him along the way for the last four months on her own. I chatted with her about homeschooling for a while. I felt humbled by the challenge she took on – hats off to her. 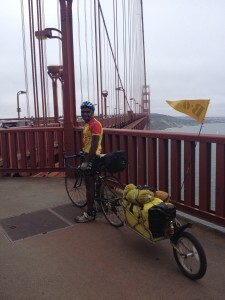 After having pedalled a total of 4040 Km’s since I left Anchorage, I am now in San Francisco. 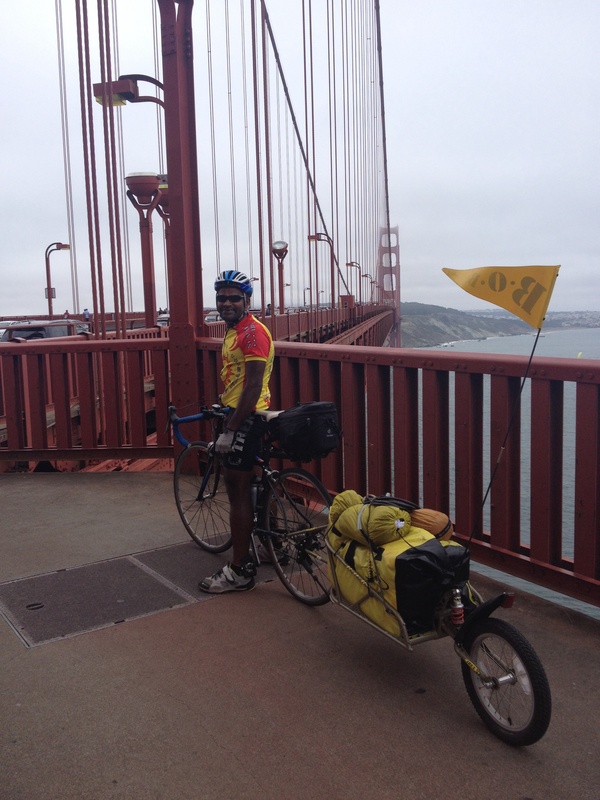 I am having a week off here and will resume my journey on Sunday the 10th of August towards Los Angeles. Many thanks to Warmshowers hosts Stephen, Kenny, and Bob and Marianne who hosted me at McMinnville, Brandon and Eureka respectively during this part of my trip. Well i could see yours today, Have a safe trip, Particularly take care of your health. Any organisation following your trip?